A ham radio walkie talkie can make a difference if you are lost or injured on trails in our local mountains - it has many times at the Angeles Crest 100 mile trail race. Ham radios have much much better coverage than license free FRS walkie talkies and can operate through mountain top repeaters - Ive talked from Catalina to Arcadia while doing the Avalon 50. Cell phones do not work in much of the mountains or immediately after earthquakes and other disasters - ham radio is the first line of emergency communications. This was quoted from this web page in the "Why Ultras Need Ham Radio" article in Ultrarunning Magazine. If race sweeps have a ham walkie talkie, they can immediately summon help rather than wait until the word gets to the next aid station. Runners can also radio ahead before they reach their crew to tell them exactly what to have ready and waste less time in the aid stations. 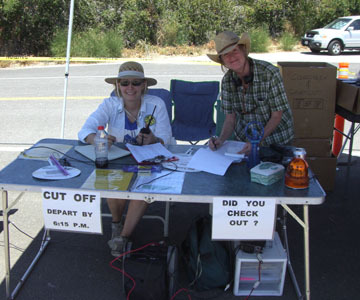 Ham radio clubs often provide race communications at trail race aid stations. If you are entered into an event, you can find their set up at the start line and ask them what frequency to set into your walkie talkie. If you are lost, snake bit, injured, etc., while on a training run in our local mountains, a call on your ham walkie talkie can get help coming right away. If working an aid station, you as a runner and a ham can best communicate the needs of that aid station to the event organization than a non-runner ham - We can really use you at the Angeles National Forest 50K/50 mile trail race and AC100 especially for sweeping and/or taking down the trail markings after the last runner. I most always have my Wouxun walkie talkie clipped on my belt pack or Camelback when I do a trail run or bike - it only weights 9oz and the batteries last over 8 hours on a charge. This HT transmits on two of the most popular VHF and UHF ham bands with the highest number of mountain top repeaters and links- 2 meters and 70cm and over 100 programable memory channels. But best of all, it has two receivers in it that cover from FM broadcast, marine, weather, SAR, police, fire, FRS, all the way to 520 MHz - perfect for emergencies. Cost is about $119 for the Wouxun KG-UV3-2 by it self, a little more with accessories, at the Ham Radio Outlet store in Burbank. 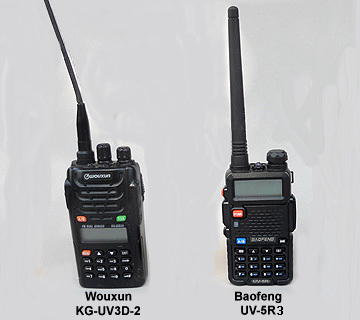 As an alternative, you can order the Baofeng UV-5R on line from RandL Electronics in Ohio for about $30 delivered. Weight is 8oz. Tom can program them for you and show you how to operate the walkie talkies. License Classes and Testing - The entry level Technician Class FCC Amateur Radio license is all you need to carry and legally use a ham walkie talkie on trail runs, working aid stations or sweeping. A ham license is good for 10 years and is renewable on line at no cost or retest. There are 35 multiple choice questions from a pool of over 300 of which you can miss no more than 7 to pass and learning morse code is no longer required. Cost of the initial test is about $10. The easiest, and takes the least time, is an one day class and test that is given 4 times a year - mid January, April, July and October - from 9am to 4pm on Sundays. Location is at the Agoura Hills Calabasas Community Center, 27040 Malibu Hills Road Calabasas, CA 91301, for $75 and requires some pre-study. They use the "read only the right answers" method for passing a multiple guess type of test and have a 97% pass rate. After you get your license, you can learn what you need for the kind of operating you want to do. They have follow on classes. The South Pasadena Amateur Radio Club has a good web page on getting a ham license and does testing once a month at the Huntington Hospital in Pasadena. The Crescenta Valley Radio Club has a good link to a web page with How To Get Your Ham License In 7 Days if you want to self study. The Associated Amateurs of Long Beach host a testing session every 3rd Saturday morning at 9AM at Cal State Long Beach. You must pre-register and the cost is $5. There is a local Technician 2 day class in Eagle Rock held in mid May and October by a radio club. The class goes from 9AM to 5PM saturday and 9AM to 3PM sunday with the test at the end. The class will go through all the possible questions and answers to pass the test. Cost is $50. Location is the Eagle Rock City Hall, 2035 Colorado Blvd, LA CA 90041. Contact the instructor Ken Chafin, W6CPA at 818-957-1699 or email w6cpa at arrl.net for details or questions. Click here to find out other places where you can take a class and click here for the FCC tests in the Los Angeles area. There are some good web sites that explain What Is Ham Radio and how to pass the FCC Exam. You can take practice exams on the web - Select the 35 question Technician exam. You can also download all the FCC pool of exam questions and a book if you prefer to study on your own. 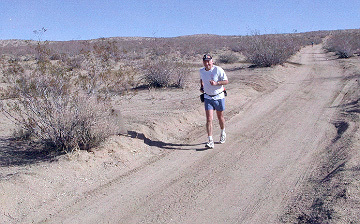 Tom O'Hara, W6ORG, and his HT picking up the rear at the Hi Desert 30K/50K trail race in Ridgecrest. Contact was kept with the finish line and aid stations just in case there were any runners in trouble inbetween them. Mary Ann O'Hara, WB6YSS, checked on him from time to time too with her ham radio as she worked at the last 50K aid station. Three popular hand held radios suggested for taking on the trails. You can get an earphone/mic for hands free monitoring. Also there are optional accessories such as a hand mic and a magnetic mount antenna for mobile and aid station operation. Maria Vangilder, KG6REG, and Sharon Spinnler, KF6OQO, radioing in the runner check out times to the finish line from the clubs Shortcut aid station at mile 40 of the Mt. Disappointment 50 Mile trail race. 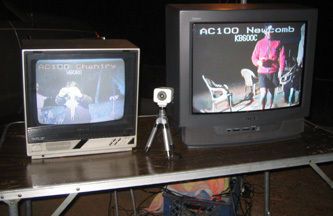 Two way live video and audio between the Chantry Flat and Newcomb AC100 aid stations via ham radio was originally set up for better medical evaluation of runners at the remote Newcomb aid station, but later crew and friends enjoy seeing and encouraging their runner as they wait for them at Chantry. By listening in or checking in on a ham net as a guest or member each week or a few times a month, you can stay familiar with the operation of your radio and ham practices so that you will be more efficient and feel comfortable when you use it supporting trail races. Monday 7:00pm - Catalina Amateur Radio Assn. (CARA). 146.09+ repeater at the Airport in the Sky, memory channel 004. Starts with weekly ham news from the ARRL then CARA member check-ins. Guest check-ins taken at the end usually around 7:30-7:45. Check-in with first name, call letters and city. This club provides communications for the running races in Catalina as well as others in the LA/OC basin. Monday 7:30pm - Sierra Madre Community Emergency Response Team (SM CERT). 144.330 simplex (156.7 tone), memory channel 048. Sierra Madre hams called first, then surrounding city hams who check in with some regularity and then any guest check-ins. Check in with first name, call letters and city. This group provides communications for the Mt. Wilson Trail Race, Alegria Ave Halloween Street event, Wistaria Festival and other Sierra Madre events. Thursday 8:00pm - Amateur Radio Emergency Service, Northeast LA section (ARES LAX NE). 446.940- (100.0 tone), memory channel 083, on Mt. Wilson and linked to a number of DARN system repeaters. After Member check-ins guests will be called. Check-in with call sign given phonetically, first name and city. Provides communications for LA County Disaster Communications (LA DCS), FEMA, AC100, and area hospitals. Saturday 8:00pm - Crescenta Valley Radio Club (CVRC) 146.525 simplex. Provides communications for the Montrose Christmas Parade and practice for the CVRC Emcomm plan. They also operate a repeater on Mt. Thom (Glendale) on 146.025+ (136.5 tone). Wednesday 7:30pm - South Pasadena Radio Club (SPARC) 145.180- (156.7 tone) atop the TELCO building in Pasadena. Provides training and services for Emcomm. Wednesday 7:00pm - Pasadena Radio Club (PRC) 145.180- (156.7 tone) atop the TELCO building in Pasadena. Holds a series of 7 Thursday evening ham license classes and testing at the end. These classes provide a real knowledge of amateur radio and equipment. The domain of this page is Foothillflyers.org copyright ©2019 Tom O'Hara. All rights reserved.